Pi�eyro, M., Cabrera, J., Quintans, F., Tejera, M. & Chalar, G. Effects of hydraulic residence time in experimental constructed wetlands on wastewater treatment of a fish factory. Pan-American Journal of Aquatic Sciences, 11(2): 93-102. Download PDF file (2,368 Kb). Marcoval, M. A., D�az, A. C., Pisani, E. & Fenucci, J. L. UV radiation effects and bioaccumulation of UV-absorbing compounds in Artemia persimilis larvae. 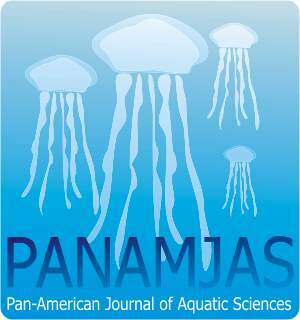 Pan-American Journal of Aquatic Sciences, 11(2): 103-112. Download PDF file (330 Kb). G�mez-Paiva, V., D�az, O. D., R�os-Rojas, B. & Crescini, R. New records of polychaetes (Annelida: Polychaeta) associated to Thalassia testudinum at Boca del R�o bay, Nueva Eesparta, Venezuela. Pan-American Journal of Aquatic Sciences, 11(2): 113-122. Download PDF file (1,248 Kb). Queiroz, V. & Sales, L. A new color pattern for the ascidian-symbiontic Lamellaria mopsicolor (Mollusca: Caenogastropoda) in northeastern Brazil, with a discussion of its symbiotic lifestyle. Pan-American Journal of Aquatic Sciences, 11(2): 123-129. Download PDF file (2,150 Kb). Mentz, M. B., Lanner, M., Fagundes, N., Sauter, I. P. & Marques, L. S. Ectoparasites on Mugil liza (Osteichthyes: Mugilidae) from the Tramandai-Armaz�m lagoon system, Southern Brazil. Pan-American Journal of Aquatic Sciences, 11(2): 130-134. Download PDF file (1,128 Kb). Pereira, L. L., Damasceno, J. S., Vitoria, E. L., Silva, M. H. & Rarro, A. P. C. Comparison of DNA extraction protocols for different marine fish tissues. Pan-American Journal of Aquatic Sciences, 11(2): 135-142. Download PDF file (963 Kb). Klautau, A. G. C. M., Cordeiro, A. P. B., Cintra, I. H. A., Silva, L. E. O., Bastos, C. E. M. C., Carvalho, H. R. L. & It�, L. S. Analysis of the Industrial Fishing of Piramutaba Catfish, Brachyplatystoma vaillantii (Valenciennes 1840), in two Estuarine Areas of the Brazilian Amazon. Pan-American Journal of Aquatic Sciences, 11(2): 143-150. Download PDF file (250 Kb). Bueno, G. W., Feiden, A., Roubach, R., Matos, F. T., Klein, S. & Boscolo, W. R. Different sources of phosphorus supplementation and its excretion by Nile tilapia juveniles (Oreochromis niloticus). Pan-American Journal of Aquatic Sciences, 11(2): 151-158. Download PDF file (196 Kb). Barbieri, E., Gon�alves, C. A. & Silveira, L. F. First occurrence of Franklin s Gull ( Leucophaeus pipixcan , Wagler 1831) in Ilha Comprida beach, Southern coast of S�o Paulo state, Brazil. Pan-American Journal of Aquatic Sciences, 11(2): 159-164. Download PDF file (2,676 Kb). Gurdek, R. & Acu�a-Plavan, A. Intra-annual length-weight relationships for juveniles of Micropogonias furnieri (Desmarest, 1823) in a sub-estuarine system from Uruguay. Pan-American Journal of Aquatic Sciences, 11(2): 165-169. Download PDF file (1,641 Kb).